OMAHA – Dec. 23, 2017 — New England transplant, Rachel Smith, is spending Christmas in the Midwest this year. The second-year apprentice has already begun making her mark on American Midwest Ballet with a lithe and fluid style that is a joy to watch. 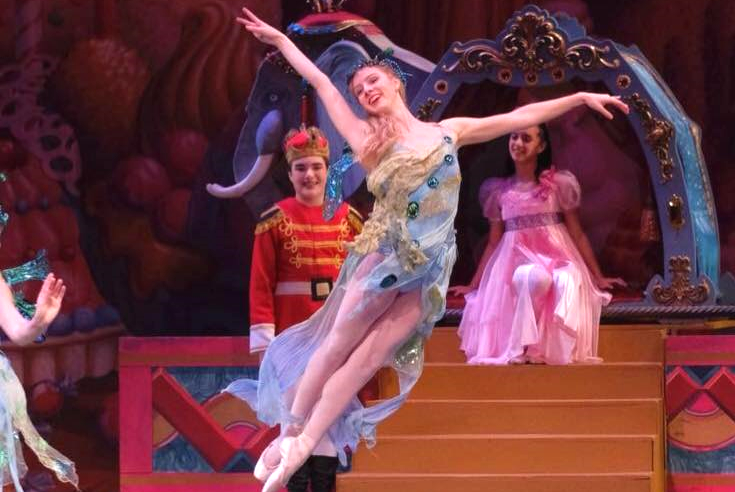 Rachel is journeying eastward again soon — albeit a bit farther south than usual — for her debut in the Ballet Vero Beach production of Nutcracker on the Indian River Dec. 29-30 where she will meet up with family for a post-Christmas reunion in Florida. But first — more dancing! What roles are you performing in Ballet Vero Beach’s The Nutcracker? In Ballet Vero Beach’s Nutcracker on the Indian River, I am a Porter, Snowflake, Sandpiper, and a Flower. I am excited to be performing such a variety of characters. I am looking forward to bringing the magic of The Nutcracker to life with the larger corps de ballet pieces like Snow and Flowers, as well as having the opportunity to put my own personality and flare into the more featured roles of Porter and Sandpiper. It will be an exhausting and unforgettable production! This holiday season I will be spending Christmas in Hastings, Nebraska with my boyfriend and his family. Usually I spend the holidays at home with family in Plymouth, Massachusetts, but with our busy Nutcracker schedule I won’t be able to make it home until after the new year. Luckily I have lots of family who will be traveling to Vero Beach to see the performances and have our own unique Christmas celebration in Florida! The best thing to happen to me this season is just being able to be a part of American Midwest Ballet and Ballet Vero Beach. I am very lucky and thankful to be able be a part of such a wonderful, talented, and loving group of people. Being able to grow as a dancer and an artist is infinitely easier when you’re surrounded by people who support and encourage you. I cannot wait to take the stage for my debut performance with Ballet Vero Beach.